When it comes close to autumn and winter, generally there are a lot of questions that start to arise about ankle boots. People wonder how to wear them, what not to wear with them, are they suitable for work? There are a large variety of different types, from heeled ankle boots, to flat, cut out styles, buckle boots and the list goes on. For that reason, there are a range of different ways to style and wear them, so they are easier to style than you may think. You’re almost guaranteed to find a pair or of women’s ankle boots to suit your personality and your wardrobe. 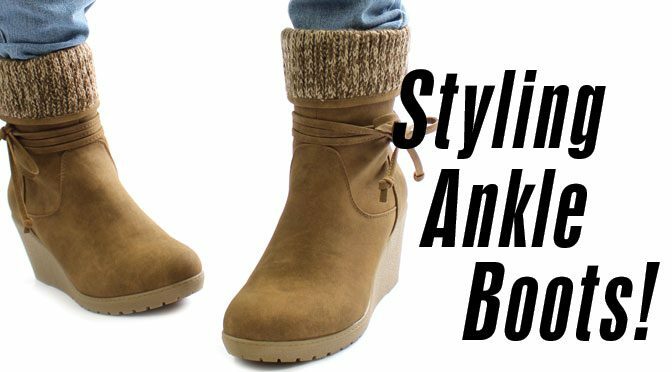 Here are a few tips and tricks for how to wear ankle boots as well as how to choose the best ones for you. Ankle boots are flat or heeled boots that end somewhere around the ankle. Some styles hit the bottom of the ankle, others hit just above and some have a little cut out around the ankle area. Ankle boots suit most people, yet to pull off the look successfully you have to find the style that suits your body type and personal style. So with the right style and colour of boot, they’ll look great with any outfit. – If your body is a pear shape, boots with a heel or wedge will usually work best. These will prevent the attention from being drawn downwards. – If your body is classed as an inverted triangle shape (wider shoulders and slimmer hips), you want to draw the attention away from your shoulders and down to your legs. For this reason, try wearing brightly coloured or embellished boots. – With a rectangle shape body type, you want to add curves, any boots that have a lot of detail are the best choice. – Bright coloured boots that are embellished are best for an apple shaped body. You can wear ankle boots to most occasions, you just have to know how to wear them appropriately. The most common boot, and the easiest to wear is the heeled ankle boot. If you want to wear these boots to work, you can achieve a smart and polished look if you style them right. High heeled boots go well with pencil skirts and sheath dresses. These boots are easy to pair with several different outfits, especially if they have a neutral colour. Although, the lower the heel gets, the harder they are to style, especially for work places. If your booties have a small heel, try going for A-line skirts, flowy dresses, or even with trousers. Try wearing trousers that are cropped just above the ankle. When it comes to work wear, the most difficult boot to wear is a flat ankle boot. These give off a much more casual vibe, unless you dress casually at your workplace we suggest leaving these for another time. Ladies ankle boots can be worn with a variety of different items of clothing, and outfits. Trousers are a great thing to wear with ankle boots, especially cropped trousers that end just above the ankle. Cropped trousers get along seamlessly with ankle booties. This is the same for jeans, you can cuff your jeans to show off a little bit of that ankle. Doing this will help slim your ankle and legs down, so they don’t look chunky. If you’re going to wear boots with jeans, skinny jeans are the way to go. Skinny Jeans will make your legs look slim, because these boots sometimes aren’t the most flattering item. This is why showing off an inch or two of your ankle will help, as it slims down the appearance of the ankle. Wearing long socks with boots has slowly come back into style. When pulling this off you don’t want to draw too much attention to only your ankles. When autumn brings the cooler weather, layer a pair of socks over some simple leggings or wear your favourite skirt with socks and flat booties. This trend works better with boots without a heel but you can wear this with either low cut, or high cut boots. If you want to make your legs look lovely and long, try wearing something all black, from the waist down. For example, a black skirt, or even shorts, with black tights and black boots. This look can also be achieved with black trousers and black boots. Add some colour to the top half of the outfit, so it can lighten it all up. One of the classic ways to wear ankle boots, is with a summer dress. This outfit is so incredibly easy to put together too. Just simply grab your favourite summer dress and add a pair of ankle booties. If it’s a little chilly, add a cardigan, then you’ve got a simple but stylish outfit. Dresses also go with any type of boot, high heeled, no heel, whether they end above your ankle, or just below making this look so easy to wear. As long as you feel comfortable and confident in your outfit, you can pull almost anything off. Ankle boots are seen as a hard item to style, however there are so many different styles available, it makes finding some that work for you far easier than you might think it should be! Find the design you like, in the colour you like and create outfits with your boots in mind, using this article for inspiration. We know we’ll be rocking some great ankle boot looks over the next few months! Autumn Winter Trends You’ll Love! Here at Shoe Zone we love shoes! We're here to share our top tips, give you exclusive sneak peeks of the new seasons and share our readers very own hot picks! So if you love shoes, you've come to the right place! Try Out Our Free Shoe Quiz! What's Your Shoe Personality? Take the quiz to find out! Keep your feet happy with these simple budget shoe hacks!